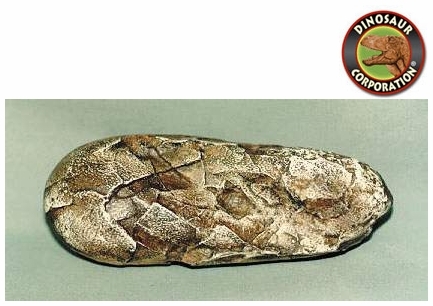 Oviraptor egg. Oviraptor philoceratops. Fossil replica. * Upper Cretaceous Mongolia. Oviraptor lived during the late Cretaceous period, about 88-70 million years ago. Oviraptor was one of the most bird-like of the non-avian dinosaurs. Its rib cage, in particular, displayed several features that are typical of birds, including a set of processes on each rib that would have kept the rib cage rigid. A relative of Oviraptor called Nomingia was found with a pygostyle, which is a set of fused vertebrae that would later help support the tail feathers of birds. Skin impressions from more primitive oviraptorosaurs, like Caudipteryx and Protarchaeopteryx, clearly show an extensive covering of feathers on the body, feathered wings and feathered tail fans. A tail fan is also indicated by the presence of a pygostyle in Nomingia, suggesting that this feature was widespread among oviraptorosaurs. Additionally, the nesting position of the brooding Citipati specimens implies the use of feathered wings to cover the eggs. Given the close anatomical similarity between these species and Oviraptor, it is highly likely that Oviraptor had feathers as well.